Linda Libby in “An Iliad” at New Village Arts in Carlsbad. When men go off to war (waging battles men have initiated), it’s the women who stay behind, raising the children, praying and waiting, welcoming home the maimed and mentally ravaged, and burying the ones who didn’t make it. 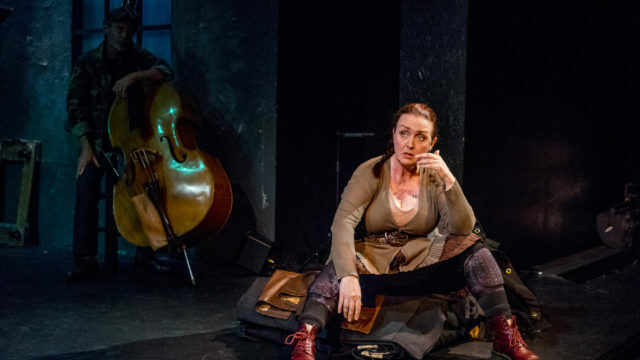 So, although “An Iliad” was written by Lisa Peterson and Denis O’Hare to be performed by a man (initially, O’Hare), it makes perfect sense, and offers heightened emotionality, for this potent, poetic anti-war oration to be delivered by a woman. (Now, of course, though it isn’t mentioned in the text, many women are soldiers, choosing not to be left behind). An Iliad, by definition, is a series of miseries or disastrous events. “THE Iliad” is Homer’s epic poem about the Trojan War. The 2012 play (based on Homer’s Iliad, as translated by Robert Fagles) is a solo performance with music. At New Village Arts, the double bass is played by Gunnar Biggs (The Muse), who composed the soundscape. 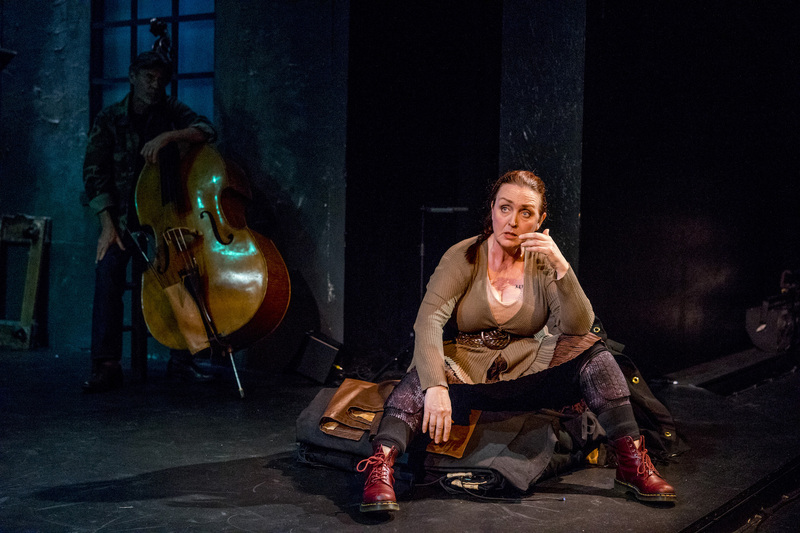 Linda Libby gives a bravura performance as The Poet, a world- and war-weary singer of historical songs, who travels the globe, observing and recounting the horrors and losses of every war since time began. Her story focuses on the Greeks and Trojans, fighting for a decade in 1200 B.C., spotlighting specifically the decent family man, Hector, and the rage-filled mega-warrior, Achilles. Talking at times at breakneck speed (sometimes in ancient locutions, sometimes modern, occasionally in Greek), she seems like she’s rushing to get through it all, to be done with this retelling, so she can pack up her little, beat-up suitcase and move on to the next sorrowful, angry recitation. She used to sing more, she tells us. Now, she seems so exhausted by it all — all this pointless fighting and dying. And yet, it goes on. And so does she. At the play’s most potent moment, she starts cataloging a world history of war, local and global, listing them all, from Troy right up to Aleppo, Syria. She repeatedly yanks us into her tale, contemporizing it, drawing parallels between Hector’s fury and, say, road rage. She makes us part of human bellicosity, and makes us all complicit in the ubiquity of battle. This direct telling makes an ancient, brutal tale of pride, ego, rage and revenge seem fresh and timely. And, sadly, timeless. Libby plays multiple characters (perhaps most compellingly, Hecuba, the mother of Hector), lulling and cajoling us, and then alarming and devastating us. The horrific death of Hector is related in the most graphic way. We hear from the wives, even the gods. It’s a non-stop, hyperverbal, 90-minute marathon — and Libby runs it like an Olympic athlete. With the backstage opened up (Libby makes her entrance from the parking lot door upstage), the set (John Anderson) features ladders and ropes (sails are launched at one point), a cart, a table. Not many props are needed; this “tale as old as time” is told through words and imagery, The Poet interacting intermittently with The Muse. In the production at the La Jolla Playhouse four years ago, that bass playing Muse was a palpable, anguished character in the piece. This time, the music seems more punctuation than conversation — and the grating, tape-looped bassline has all the repetitive circularity of the ceaseless parade of wars it underscores. Jacole Kitchen’s direction is robust, muscular. The lighting (Alex Crocker-Lakness) and sound (Melanie Chen) are effective. The costume (Mary Larsen), reminiscent of Army-issue boots, jacket and rain poncho, is convincing if not flattering. Libby works it — and she has a wonderful way with a trailing length of fabric. Her performance begs to be seen. How many more times, for how many more millennia, will this beleaguered Poet be called upon to remind us of the plague of war? Will we ever learn? Can we ever stop? Performances are Thursday-Saturday at 8 p.m., with matinees on Saturday at 3 p.m. and Sunday at 2 p.m.